- I've been backing up my macbook pro's with 2.5" hdd in external enclosures. It works well enough but it's a bit of a hassle to have to dig out the portable hard drive and hook it up. A 2gb time capsule is a ridiculous $500! A 2TB hard drive runs $90 and the top of the line netgear wndr3700 wireless router is $150. I refuse to pay a $260 apple tax. I already have a windows 7 x64 machine that is on 24/7 with 2TB just sitting there ready to be used. - So I started looking around to see if I could use time machine on snow leopard to backup to a windows (samba) share. I started with this key hint: http://hints.macworld.com/article.php?story=20090905212640957 (read the comments about some potential risks though I'm willing to live with them). - Make sure you share the exact folder you want the backup to be in. Example if you want to save your backups into d:\backup make sure you create a share at the backup level and not at d:\. This way when you mount the samba share if you look in /Volumes you should see /Volumes/backup. - If you are cutting and pasting on how to run the script there is an extra space after "sh" that needs to be removed. I also sudo it just to be safe. - For my two macbooks each with 500gb hard drives with about 320gb dedicated to osx (the rest to bootcamp) I made the sparse bundle 500gb each. - After doing all the above I was able to use time machine with a windows share. I would recommend gigabit ethernet for the initial backup but wireless works fine too. - Some people seemed to have problems getting this to work. Some suggestions made were to use the ip address to mount instead of the machine name and use an all numeric password for the share. I didn't have to do any of this since it just worked for me. 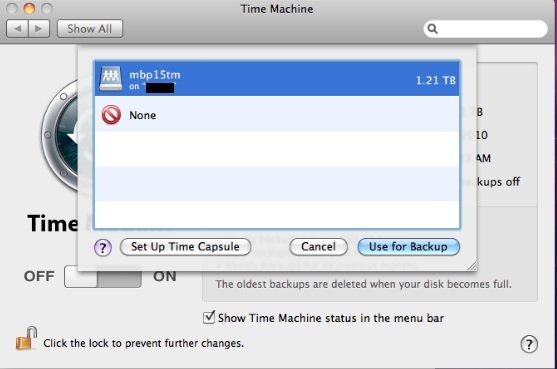 This little hack makes time machine a lot more convenient and sure is a LOT cheaper than a time capsule.